Edraw offers a large collection of vector-based illustrations which help users perfectly decorate your diagrams. 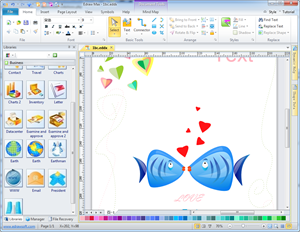 Go to Clip Art Library and find versatile and beautifully designed clip arts categorized in different groups. It's more convenient and handy than you think! An illustration is the visualization or a depiction, such as a drawing, sketch, painting, using a graphical representation. Illustrations are used to embellish, clarify, or decorate something. See how illustration can enhance visuals in Free Clipart for Presentation, Homework and Diagram Design. It can range from a simple black-and-white cartoon to a full-color billboard and beyond. Illustrations are an essential part of publishing and transaction printing. Edraw software provides a wide range of illustrations for you to choose, such as animals, food, weather, flags, vehicles, professions, etc. Moreover, you may learn how to create funny illustrations here. Contains some animal symbols for common use. Contains some business symbols for common use. Contains some finance symbols for common use. Contains some food symbols for common use. Contains some flag symbols for common use. Contains some office symbols for common use. Contains some people symbols for common use. Contains some profession symbols for common use. Contains some school symbols for common use. Contains some technology symbols for common use. Contains some vehicle symbols for common use. Contains some weather symbols for common use. Contains some business scene symbols for common use. Edraw Max includes more than 6000 vector clip arts to personalize your business diagrams, greetings cards, header paper, flowchart, network diagrams and much more! You can choose from several categories including animals, business, finance, food, office, people, and many others. No need extra authorization to distribute these clip art in your drawing with Edraw Max. Check out the amazing usability of illustration in Clipart for More Vivid Cause and Effect Diagram.